You've seen her work in the beading magazines, watched her on You Tube, and drooled over her designs in her books. Now come on out and have a class with this extraordinary designer, author and instructor! 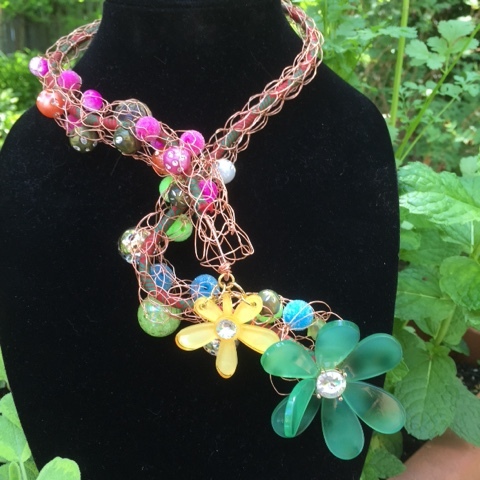 BeadFX is pleased as punch to have Jill Wiseman come all the way from Texas and teach three wonderful classes. Those who have taken a class (or two!) with her have shared how incredibly patient she is and how much fun her classes are! 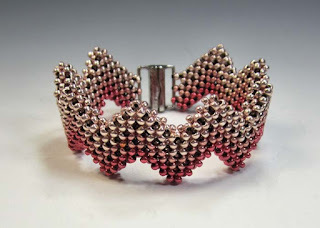 Cubic right-angle-weave doesn’t have to be scary! In this class students will learn an easy way to make a cubic right-angle-weave strip and then change it up by changing directions and colors. Usually when CRAW is taught, it is shown as a single strip of cubes – by learning how to create a solid block of CRAW, you open your beadweaving to new possibilities! 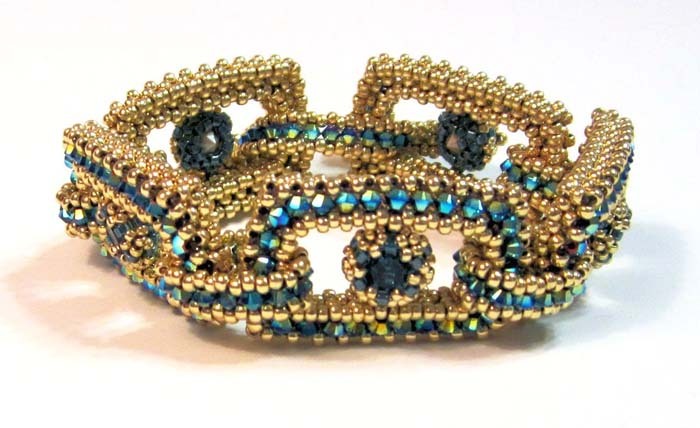 The instructions for a companion necklace piece to this bracelet, will be included in the class materials. Level: Intermediate; should be comfortable with flat right-angle-weave. 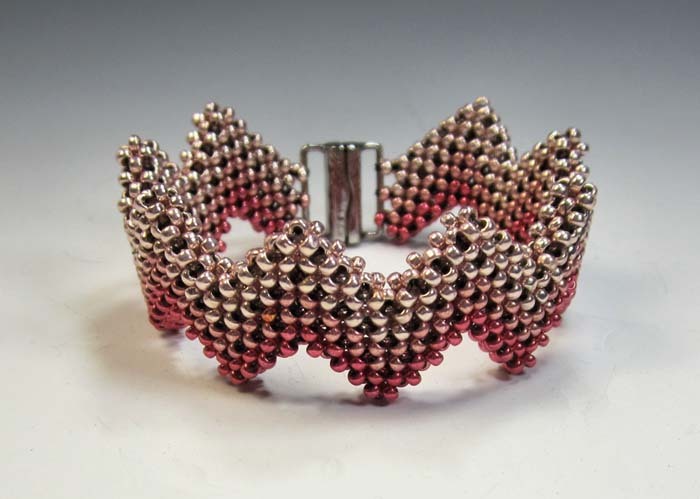 Cubic right-angle-weave doesn’t have to be scary! In this class, we’ll learn the basic CRAW stitch, figure out how to turn corners, and then round it out by joining two pieces together. A simple but striking netted bezel wraps sparkly chatons as center focals in the CRAW units. 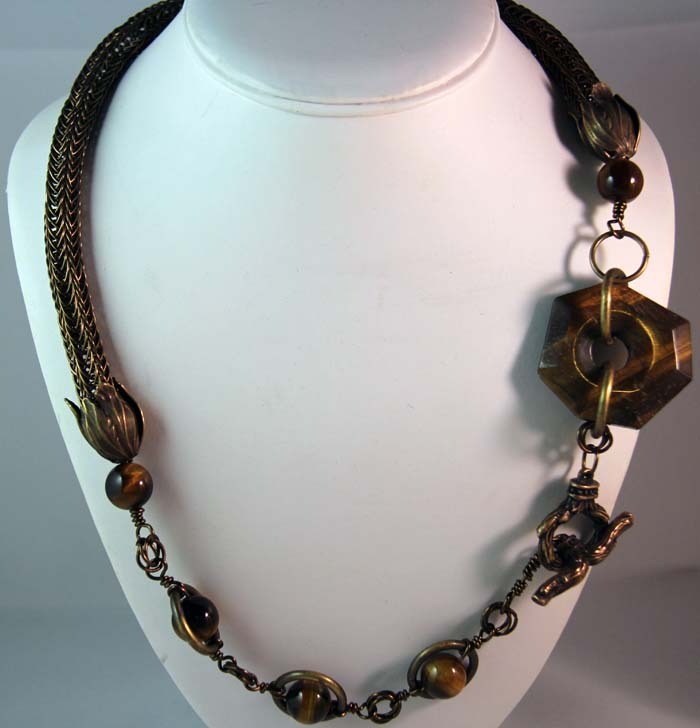 The instructions for the companion piece to this bracelet, Shining Moment Necklace, will be included in the class materials. Level: Intermediate; should be comfortable with flat right-angle weave. The vision for this bracelet came from a vintage necklace I found on the internet one day. 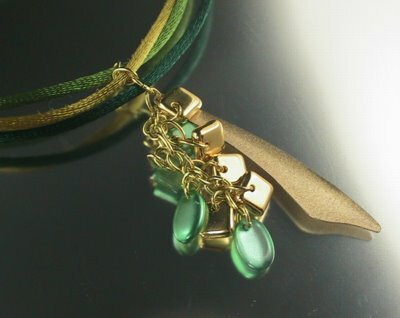 While I made a bracelet, it can certainly be turned into a necklace again. A bezeled chaton for the center, 2mm crystals line the center of the petals, and a double loop closure are some of the details that make this piece so special. Level: Intermediate; knowledge of peyote is required; right-angle weave will be helpful. As of August 2, the regular class fee of $215 + HST will apply. 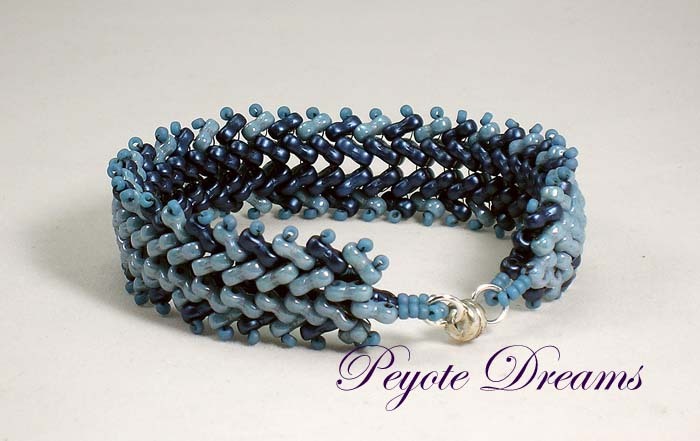 This offer has already gone out to various bead societies (its good to belong!) and is now opened up to the general public. 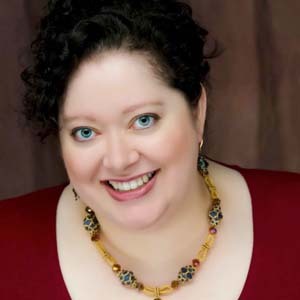 There's more: Register for two or more of Jill's classes and you will automatically be included in buffet dinner with Jill on Saturday, September 26 (details to follow). All the details about each class, including the materials to bring, is on our website. To register, call the store at (416) 751-1911. The store staff will be happy to serve you. Simply string the stones and spacers on heavy softflex - you can follow the picture or do as you please. End it by adding a large hook clasp and a large swivel link. Enjoy the compliments you’ll surely receive when you step out in style with Chunky Rose. I've taught a class in the past that reviews the many ways you can colour metal: inks, paints, nail polish, pastes, flame and on and on. Recently I went back to enamelling and fell in love with it, and the possibilities this technique offers, all over again. 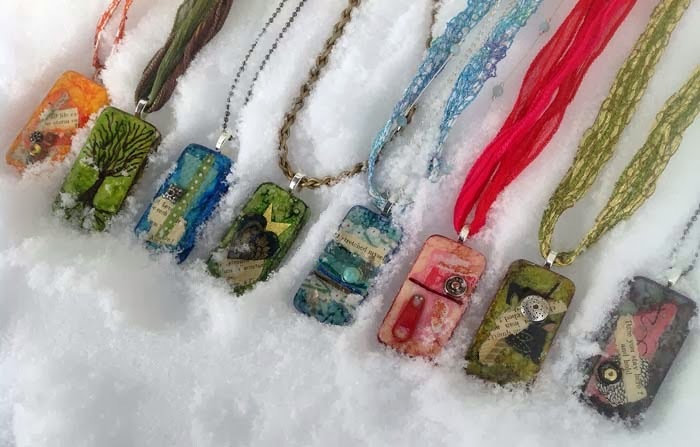 I'm looking forward to offering some new enamelling classes at BeadFX in the coming months that feature new ways to add texture and interest to your pieces using enamels. Watch for that info on the classes pages of Beadfx.com. 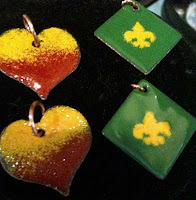 This weekend, July 4, I'm teaching a beginner enamelling class. 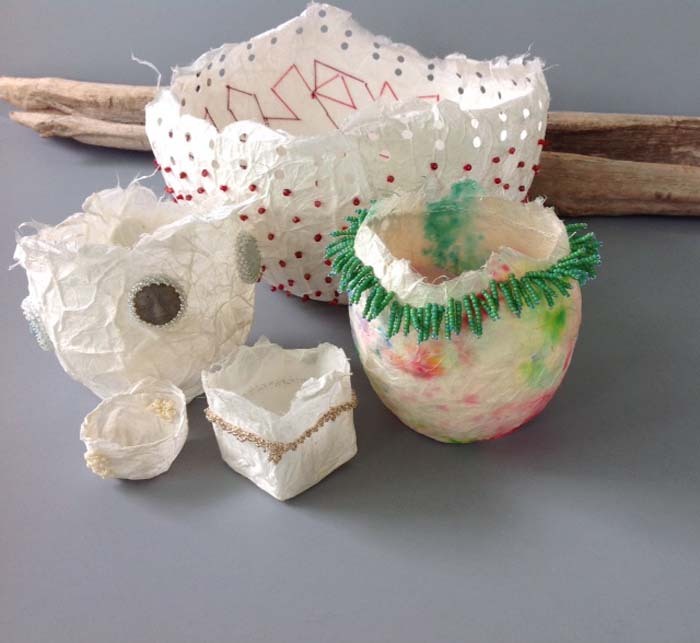 Learn the various methods for preparing your metal, sifting and firing and the many effects you can achieve. On the beaducation.com web site, Steven James has some great free tutorials on enamelling. 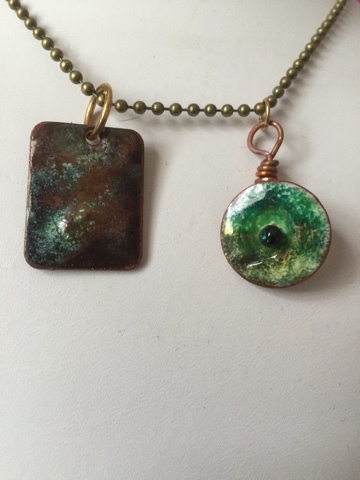 I took a class on creating a raku effect on copper using enamel with Steven. I adore raku pottery, so this was a revelation for this girl who loves playing with metal! 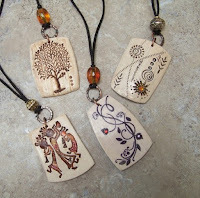 I've created some pretty pendants that are easy to make. 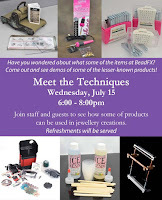 Come out to BeadFX on July 25 as I debut a class using this new take on a traditional technique. You'll love the coppery colours that flame brings out in the glass. And wow! I finally learned how exciting it can be to colour with flames and enamel using the Barbara Lewis method. What frustration and, eventually, fun I had. This technique is not for the faint of heart. Here's a picture of my station set up in Debora Mauser's class at Bead and Button. Flame and enamel can create some very beautiful results. Making coloured head pins, coating filigree beads and then learning the secrets to enamelling large, flat pieces then adding frit and other glass inclusions, really opened up a new palette to paint my dreams on metal. Can't wait to finalize designs for a fall class showcasing this. But this class will be for those with some enamelling experience under their belt. So please take a beginner class beforehand: you'll have fun and open up new design possibilities in your work. 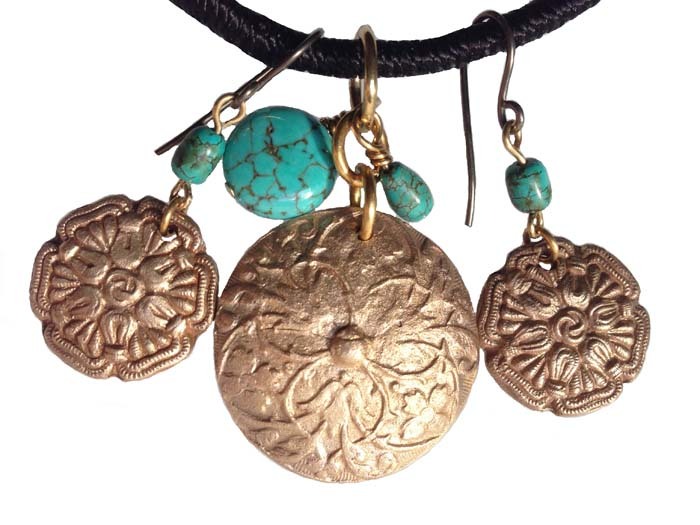 Wrap gold beads on them, make coil ends with wire, add a clasp and now you’re all done. Super simple to make and super quick. A gold metal bead was placed on the headpin followed by the focal glass bead. 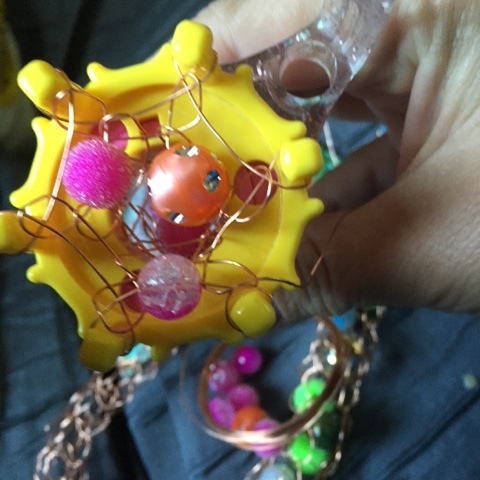 Add another gold bead and add a wrapped loop - please don’t forget to add the leverback before completing the wrapped loop. Repeat for the other side. Goth grows up, and grunge goes glamorous. These are handmade (in India) - limited quantity pendants set with genuine diamonds - mostly cognac and chocolate diamonds. You will note that the diamonds are "mine-cut" - informally cut and do not necessarily dazzle, and those of you are students of cut stones will know that the warm brown and yellow hues are amongst the most common of diamonds. However - when is the last time you bought yourself a diamond pendant? These have a quiet sophistication that is very elegant - and whether you make something simple or elaborate - a gift, or for yourself - these are timeless. And they look freakin' awesome paired with pearls. 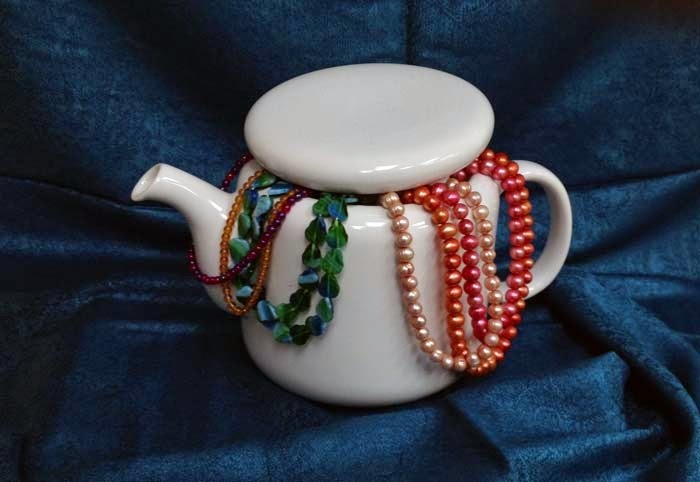 Speaking of pearls - to go with your Glam Zombie look, we have some Cornflake Keishi and some big hole pearls. 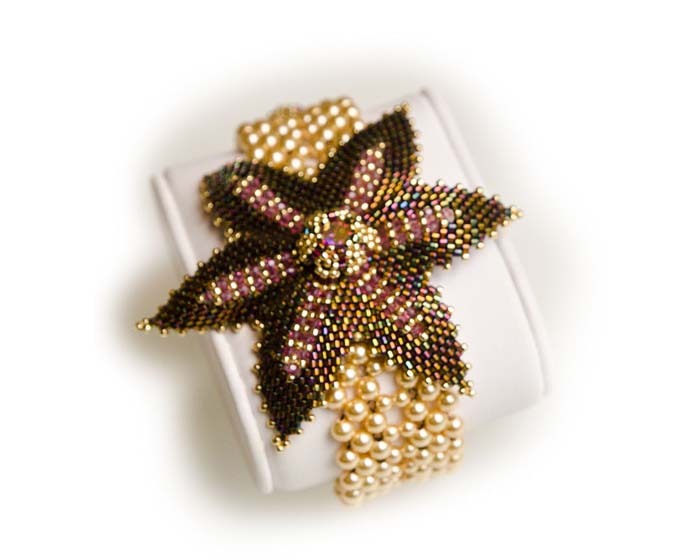 The funky and non-traditional shapes of the pearls and their connotations of tradition and elegance create a dynamic tension that lets you tell a story in your creations - about the old and the new - tradition and change, respect and rebellion - all tied together and in balance and opposition at the same time. Continuing this theme of the marriage of grunge and glamour, goth and glitz, elegance and eeeeek!, we have hugely expanded our selection of the Swarovski patina effect. This coating effect (like AB - Aurora Borealis) is a permanent coating, and has a pattern reminiscent of torn, vintage lace. We have a wide variety of shapes, but to make it easy for you to find them, we have put them onto one page - Patina Vintage Lace - as well as distributing them into their various homes, hearts, pear drops, etc. 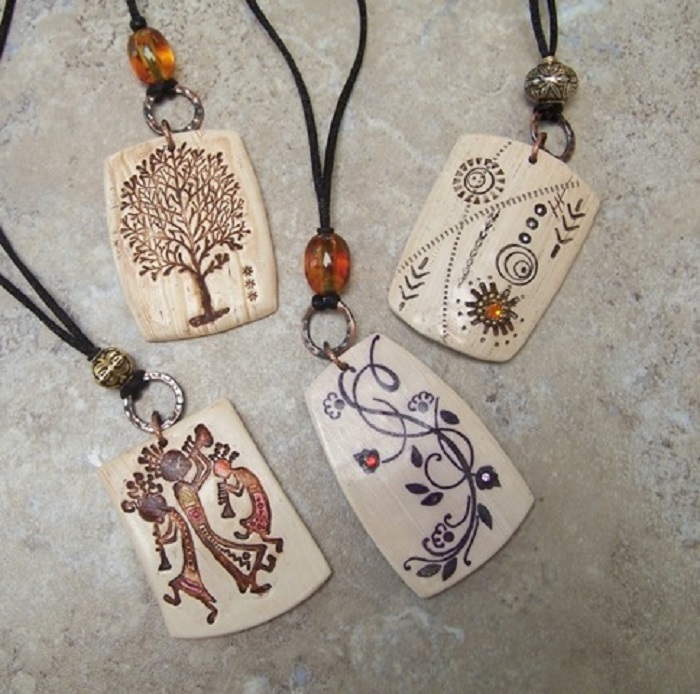 These pendants are quietly elegant and surprisingly lovely when made up into jewelry. Also new this week - more selection in the Pellet beads. 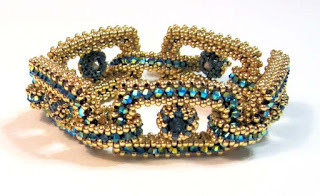 These vertebraic-shaped beads snug into each other, or act as wonderful pivot points in fabulous soutache creations - their narrow waists creating a place for the soutache to sit. Also new this week - custom and exclusive mixes! A dazzling selection of mixed beads - Firepolish and Pressed glass in eight more exciting colourways. This Victorian Story will fill you with Blue Desire. While you climb over the Sand Dunes in the Hawaii Heat, to get to Fire Mountain to visit the Fairy Queen and deliver her Ginger Snaps - you will think, "I want it All." So click on a link or image above, or check out all the new stuff here! 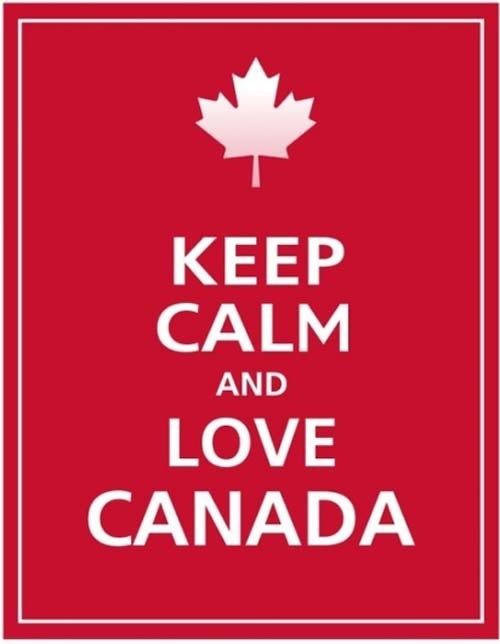 July is just around the corner, complete with Canada Day and, for our southern neighbours, Independence Day! Both are great opportunities to show our patriotism. Oh right - July classes! Yes, we are very proud of our July classes from the variety of techniques offered and the high calibre of our instructors who share their expertise. In fact, classes are scheduled each and every weekend and during several weekdays during the summer so there is no reason to be bored. We have added a new FREE event on Wednesday, July 15. 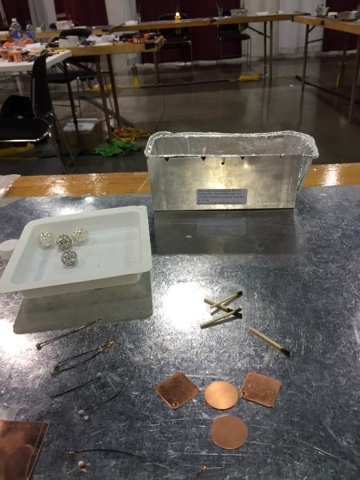 At Meet the Technique, you'll be able to see demos of some of the lesser-known products that we carry, such as the Jool Tool, wire jigs, the Big Kick and more. All are welcome and you do not need to RSVP for this FREE event. Check out all of the NEW classes with Barbara Colautti, Pamela Kearns, Anne Marie Desaulniers, and Sue Henry! Complete information about each class, including course description and applicable class and kit fees, can be found on our website. Click on 'Classes' and follow the links to the June class calendar and individual classes. This week's update is late - well - the update is fine, it all happened on time because it was all prepared ahead of time. But the actual writing about it is late. Late for the first time in 15 years. But, it's just beads, you know. No one died, nobody's private data got compromised, the website and the inventory systems are just fine, thank you. The big picture is - the only person truly inconvenienced is me. I - however - am contemplating moving into a tent and living off the grid at an undisclosed address in the middle of a field. At least until the winter drives me back home. Sigh. Why does losing your computer feel like losing a part of your life? 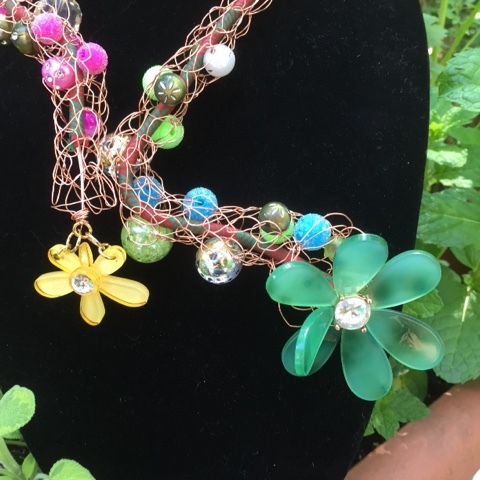 The green revolution created more productive strains of rice that helped to feed the world, and the shaped seedbead revolution created more shapes of seedbeads for you to play with, including bushels of ricey Rizos. - wait - you wanted Actual Colours? With, like, colour? Ok - how about Pastel Pink, Pastel Cream, Rose, Pastel Burgundy, Dark Turquoise Travertine ... etc, etc!, etc! Would you like some more of the True 2 mm Firepolish to go with your seedbeads? These smaller than the old style of 2 mm firepolish are a nice accent and spacer bead for stringing, and small enough to add a little sizzle to your seedbead creations, without burning a hole in your credit card like crystals can. So click on a link or image above, or check out all the new stuff here! 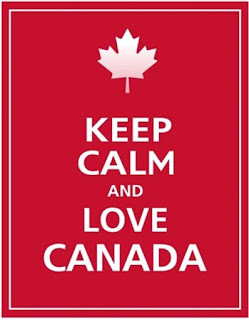 And now you'll excuse me - there is a nice little trailer listed for sale on Kijiji that might be a little more comfortable than a tent for my move off the grid ... .